02:08 lumberJ also what version of minetest are you using and what was your install method? 02:12 lumberJ did you build from source or use a ppa to install? 02:12 jas_ helpless: is that the source dir? did you build with -DRUN_IN_PLACE=1 ? 02:13 jas_ if you run from the source directory, and are building locally, the mods you placed in mods/ dir should run OK if you run ./minetest from the bin directory. 02:18 helpless can somebody send me a link to a place that actually has just a straigh up vanilla minetest please? 02:18 jas_ it's in your ubuntu apt repository! 02:19 jas_ and use whatever your version of ubuntu provides. 02:21 helpless wahts the command to remove it? 02:21 jas_ you could just edit the file, no? 02:27 helpless nvm i got it. What is the install command again? 02:32 lumberJ was anything removed? 02:33 lumberJ and how did you uninstall, did you do the sudo apt-get remove minetest or uninstall in software center? 02:34 Natechip anyone on windows? 02:35 helpless I used to do windows, need help? 02:35 lumberJ helpless, when you ran the remove command, was anything removed? 02:35 Natechip helpless: know anything about cmake? 02:36 helpless but my brother knows a bit more then I do. 02:41 helpless it looks like it was added? 02:42 lumberJ then you pressed enter? 02:45 helpless What's the command for that again? 02:46 helpless Wouldn't i have just deleted it? 02:54 lumberJ what version of ubuntu are you using? 10:40 jas_ (any way the wind blows...) https://www.youtube.com/watch?v=ESXgJ9-H-2U <-- this one is another favorite, the video is all one cut! 12:15 fireglow How can I let items drop out of a pipeworks tube? 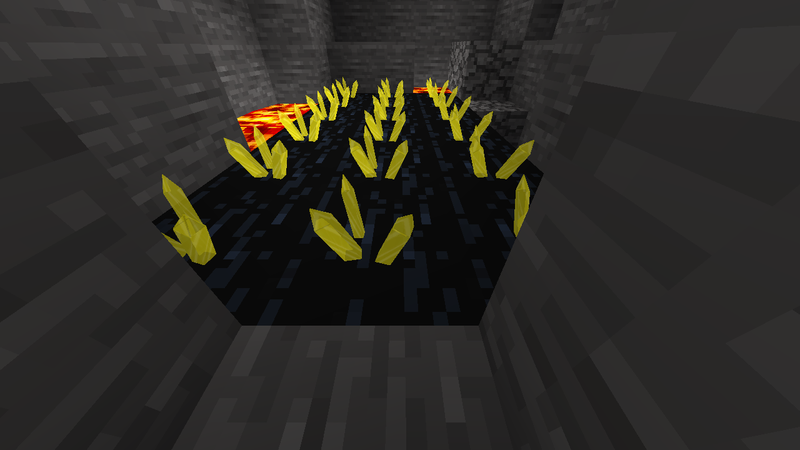 For example into a lava pit. VanessaE? 12:17 VanessaE sare_at_work: use one injector feeding into a 6-way tube junction. items will go each way, in sequence, as long as all outgoing tubes are of the same kind. 12:18 sare_at_work VanessaE: thx, the 6-way is a sorter? 12:18 VanessaE sare_at_work: no. just an ordinary tube leading into an ordinary junction to 5 others. 12:19 VanessaE fireglow: actually strike that, you can if you can force the placement of a 'broken tube' but I don't think that's normally possible. 12:25 sare_at_work so with tubes this is not possible? 12:27 sare_at_work i read about lua tubes, but that is history? 12:41 sare_at_work sry VanessaE, one question more: So the last tube way of the item is saved anywhere? 13:08 deltasquared it was a leaf miner thing, repeatedly mining leaf blocks then replacing them with a deployer, filter tube to extract the saplings. 13:09 deltasquared it's infectious, run! 13:19 deltasquared but against this built-in "flow" pressure propogation can be inconvieniently slow. 13:20 deltasquared that said, bar the classic mode cheating a bit by appearing to handle whole straight segments simultaneously at times, it's not like the pressure logic would be any slower than that. 15:00 greeter greetings, sorry to spam, asked this the other day but had to leave before i got an answer. i'm running a server with rollback enabled, and the rollback file is getting huge. it's grown by 5gb just in the past 30 days. is there any way to limit how far rollback will go back? 15:02 Krock checked the logs yet, whether someone answered you afterwards? 15:17 greeter hmm the file is still huge. does minetest need to be stopped for that command to work right? 15:34 Etzos[m] What do you mean? Why are you selecting a list of timestamps? 15:37 Etzos[m] Well, what did you actually run? 15:45 Etzos[m] `strftime('%s', 'now', '-10 days')` is probably the more natural way to do that kind of thing since you can enter a more natural expression. 15:53 Etzos[m] Oh, sorry. That's just how I show code snippets. 15:53 Etzos[m] Ignore the backticks. 15:56 Etzos[m] And I would imagine that with such a large file that delete operations would take a fair amount of time. Especially if its on an unindexed column. 15:59 Etzos[m] Oh really? It's been a long time since I've used SQLite. I spend a ton of time in Postgres, so my knowledge streams are probably all crossed. 16:01 Etzos[m] That's very strange. The command you posted is designed to delete entire rows, not column data. 16:05 Etzos[m] I'd probably need to see the entire schema/db file and I don't have Minetest available at the minute. 17:26 Dargod where I can found mt 0.4.16 stable source? 17:27 habeangur 0.4.16 stable is out? 17:29 habeangur Dargod: you meant "myself" right? 17:30 Dargod thats https://github.com/minetest/minetest/tree/stable-0.4 ? 18:26 Dargod why checkbox avaliable only on Lua Table Formspec but not in formspec? 18:43 d_deadlock hi, i am looking for some examples/explanations about the "special_tiles" in the node-registration. Can anyone point me to some infos about that? 18:54 d_deadlock thanks Krock, but already found that and it's not really explaining much. What are the special-tiles used for? 18:56 Krock see minetest_game7mods/default/nodes.lua , "torch"
18:57 MinetestBot Another satisfied customer. Next! 19:48 Dargod Fixer, thanks, all worked well!